Imagine your child running in the park. Can you hear the laughter and joy from just being outside in nature? How about climbing a tree and pretending it is the masthead of a ship? That is what our young grandson Ridge did last weekend. It was a complete joy to join in his fantasy. By standing on the ground and asking him to tell me what he could see through his imaginary telescope he brought me into his life. It is just one more suggestion to add to my collection of 77 Ways To Have FUN With Your Family For Free. Children who have the opportunity to play in nature have a heightened awareness of the world. Being in nature helps them to recognize the cycles of life and the interdependence of plants, animals and humans. They also have more advanced coordination, balance and agility. When they are involved in physical play, they develop their lungs and muscles which means they are sick less often. Being in nature creates a resilient spirit and a bounce-back attitude. It has been shown that children with attention Deficit Hyperactivity Disorder (ADHD) can concentrate better after taking a nature break to run and play outside in the fresh air. Walking together. Taking a hike with a child friend is a calming, cardiovascular-building opportunity to really “get things out in the open.” When you are walking, things may come up in conversations that would not be possible in a face-to-face situation. As you meander along a trial or sidewalk, you have a few minutes to ponder before you answer. Awareness of the world. Choose a color. I like to choose the color of the shirt the child is wearing. Now challenge him to find natural items that contain that color. Talk about hues, shades and variations of color. Help him to isolate colors in a multi-colored item like a leaf. Bird watching. Check out a book about birds from the library. Or better yet, an audio program of bird calls. Go to the woods and just be quiet. Help him appreciate the sound of silence. Teach about meditating or quieting the soul. Now watch for birds, insects and signs of other living things that live in that little corner of the universe. Smell the scents of nature. Let the adult be the secretary and write down all the smells of your yard and neighborhood. Does fresh cut grass smell differently than the lawn? What do different flowers smell like? Why does the dirt in one area of the yard smell unlike another? Why do they have different textures? What is similar and what is dissimilar? Clean along the river. Water is the most soothing part of nature to most people. As you mentor young children to make sure the banks and entryways into streams and lakes are clean and unpolluted, you teach a global lesson. All water makes it’s way to the seas, just as each one of us has an impact on the lives of each other. We live in a small, small world. Being in nature helps kids with life’s stresses and assists them to problem-solve in new ways. 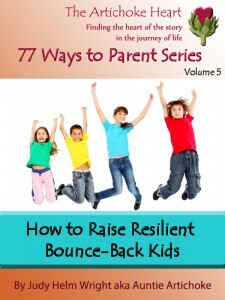 Resilient children can learn from the cycles of life, that good will follow bad and that life moves on. A child who learns to turn to nature in times of stress or conflict will acquire life skills to assist him forever. There is a peace and serenity to being in nature. There is a special joy when a caring adult can share that space and time with a child, not teaching or preaching, but just being alive in a wonderful world.